Dave Roebuck, owner and farmer of Salt Pond Oysters, operates the Shuckin’ Truck that serves oysters and seafood at events. 1. Put your palm on top of the oyster and hold it securely against a hard surface. 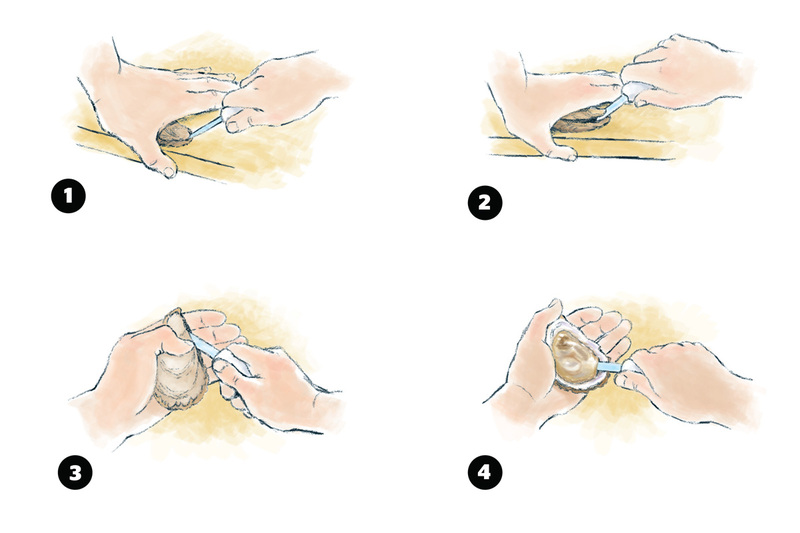 In your other hand, hold the oyster knife at a 45 degree angle, and force the tip of the blade in between the top and bottom shells at the hinge. 2. Wiggle your knife along the edge while prying up at the same time, lifting the top shell apart from the bottom shell. 3. Once the top shell is popped, run the knife’s blade along the underside of the top shell, and cut the top of the adductor muscle. The top shell should now be free. 4. Be sure to keep all the liquor inside the bottom of the oyster shell while gently slicing the adductor muscle under the meat.